During exercise or under stress, it is common to experience dryness of the tongue and the rest of the mouth. 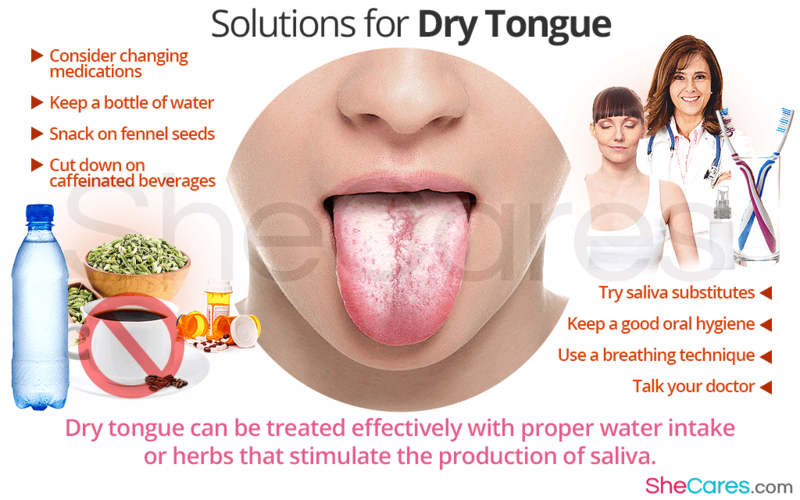 But a dry tongue can also be a symptom associated with numerous medical conditions, which can affect women of all ages. Although in many cases it is not a harmful condition, it can significantly impair women's life by reducing their appetite and limiting their social activities. Keep reading to learn the most common causes of dry tongue and the solutions to manage them effectively. Hormonal imbalance, especially of estrogen, disrupts the production of saliva, which most commonly leads to a dry tongue. Burning mouth syndrome (BMS) is a condition characterized by dryness of the tongue, burning sensations in the whole mouth, and taste changes or its loss. Vitamin deficiency, particularly in vitamins B, zinc, or iron, is recognized as the possible cause of dry tongue and other symptoms of BMS. Mental health disease, such as anxiety or depression, are believed to aggravate dry tongue sensation. Ironically, having a dry tongue can worsen the anxiety and depression. Physical diseases, such as diabetes, thyroid disease, Sjogren's syndrome, or gastroesophageal reflux disease can cause a disruption in the microbial flora of the mouth, resulting in a dry tongue. Side effects of certain medications, like antidepressants, mood stabilizers, or high blood pressure drugs, include dry tongue, because they affect the salivary glands, which start producing less saliva. Allergies to a toothpaste, mouthwash, or artificial additives found in food commonly result in a dry and sore tongue, as well as burning or tingling sensations. Damage to the nerves in the tongue or their inappropriate stimulation might result in soreness and dryness of the tongue. Oral conditions, such as fungal infection or Geographic tongue, commonly cause dry tongue, as well as a burning sensation. Alcohol, tobacco, and illegal drugs can severely dry out the tongue and the whole mouth. Consider changing medications if you suspect that your dry mouth is one of the side effects. Keep a bottle of water by your side at all times and make it a habit to take small sips throughout the day. Aloe vera juice is a good option, too. Snack on fennel seeds during the day, because they contain the compounds, called flavonoids, which can stimulate the production of saliva in the mouth and combat the dryness. Cut down on caffeinated beverages, such as coffee, tea, and soda as it might cause more dryness to your tongue. Alcohol and tobacco are also best to be avoided. Try saliva substitutes that are available over the counter to keep you tongue moist and fresh. Keep a good oral hygiene by brushing your teeth after eating. Instead of using a mouthwash that contains alcohol, try one that is specially designed for dry mouth. Use a breathing technique to prevent your tongue from getting dry, try breathing through your nose, instead of your mouth. Talk your doctor about a possible vitamin deficiency or hormonal imbalance and the ways to treat them with food, phytoestrogens, vitamins, and hormone-regulating supplements. The most optimal solutions for dry tongue take into consideration three factors: treating its cause, preventing tooth decay, and stimulating the production of saliva. If these strategies were complemented with other alternative practices focused on stress reduction, such as meditation, yoga, or breathing exercises, your dry tongue could quickly become the thing of the past.